Mordian 7th Regiment: Heresy Era Imperial Fists - Cataphractii Terminators and the Motor Pool! 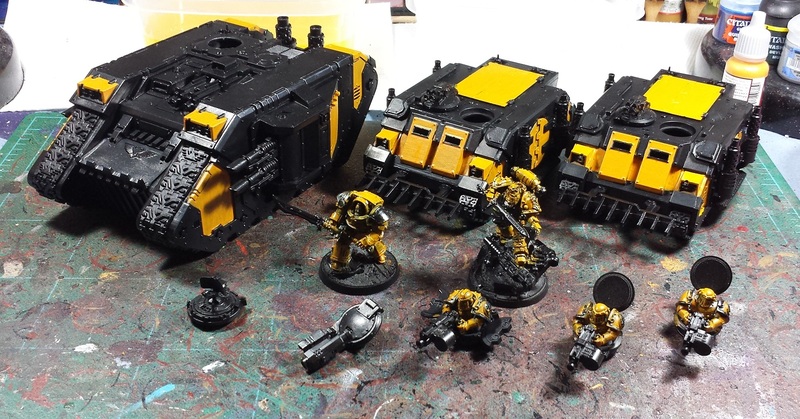 Heresy Era Imperial Fists - Cataphractii Terminators and the Motor Pool! After the post yesterday morning I was feeling reinvigorated and cracked on with the Fists! Eight weeks to Adepticon, so I'm feeling quite confident the force will be done by then with some wiggle room to build and paint another unit or character as the points values require - At the moment I'm on the wait list for every event I was hoping to get tickets for, but I'm holding out hope and building a force that can be broken down to satisfy any of the events that I may be able to slip in to! Much like the Templar Brethren, the Cataphractii terminators were also almost complete. A bit of shading and washes and they're ready for the initial sealant step. As is usually the case, right after I go about sourcing bits to do a conversion for a unit type that exists in the rules but not in the Forge World shop, they immediately go and release pics of better-looking ones that they'll be coming out with just a month or so past when I'm done with the project. Hah! Nevertheless, I like how the Custodes shields worked for the build, and when I get around to building a sword-and-board unit of Custodes proper, I'll be repeating the white wing inlays on their shields as well - Pretty happy with how they turned out! That leaves 5 models to go, as things stand at the moment. Three vehicles, and two characters. After finishing off the terminators I grabbed the big tank brush and re-painted all the tanks in chaos black, so that any re-blacking cleanup later will match up, then started laying in the basecoats for the yellows. On the big flat surfaces, even the Scrofulous Brown I use direct on the infantry is a bit too translucent, so all the areas were first given a Leather Brown basecoat. Then the Scrofulous brown went on and I laid in the first pass of Golden Yellow. While I was about it I also grabbed Sigismund and the Tartaros champion and started laying in the base yellows for them as well. It's a bizarre mix for a batch paint session but does ensure I'm not bored! At a certain point the tanks hulls, and the characters and crew will be separated for detailing's sake, but for now it's all the same colors getting spattered on with wild abandon! Sweet looking cavalcade of armoured goodness, the Custodes shields look great with those Termies, very Pollux. Congrats on getting the termies finished, those shields look really cool on them. Good luck getting into the events so that you can lay waste to all haters of painting yellow! Wow, I've painted like one iron warrior in the time it's taken to build and pretty much paint these. Well done. The colours ware superb. @Joe B: So far so good! I did manage to get into the Heresy Friendly on Friday, here's hoping there'll be a few more open slots on the other events too! @Frothing Muppet: Excellent! Looking forward to 'em! Looking great! Love the termies! Great work on the shields.